Inexplicata-The Journal of Hispanic Ufology: 1997: Puerto Rico's "Alien Foetus"
1997: Puerto Rico's "Alien Foetus"
"In mid-September of this year, the Internet crackled with the astounding piece of information that an alien foetus contained in a small bottle had been found on the body of a man shot under mysterious circumstances in San Juan, P.R.. According to reports received from Lucy Plá of the Puerto Rican Research Group and Federico Alvarez of UFOSCIPR, the television news departments of two major channels (the NBC and CBS affiliates, respectively) kept the entire island on tenterhooks for 48 hours while deciding if a genuine extraterrestrial corpse had finally been found on the island. 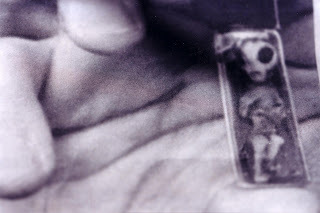 The result was predictable: a news conference was held in which each journalist present showed a tiny "keychain" made up of a vial containing what appears to be a small, shriveled Grey alien. A small test tube containing a foetus described by some who saw it as being a highly unusual creature -- leading many to believe that it may be an extraterrestrial or even a "chupacabras"-- was found Wednesday (September 18) in Santurce's La Colectora section. The tantalizing "foetus" turned out to be made of plastic. "The murder of Fred Acevedo Martínez, 31, is the second nonresident death to occur in Santurce this month. Fred, who lived in VIllas de Río Grande and his family at Luquillo's Sandy Hills Condominium, was seen at 4:00 a.m. on Wednesday by patrolmen from the Santurce Headquarters who drove down San Rafael Street. "The young man was behind the wheel of a 1981 Honda Accord, parked by a nameless eatery at the corner of Progreso alley, close to the now-vanished Corona brewery. A loud report was heard ten minutes later. A bullet had hit Fred in the left clavicle. He started the car immediately and promply crashed into two junked vehicles which had been abandoned in Progreso alley. "Policewoman Beatriz Rivera, who had noticed him earlier, reached the seen of the crime only to find the driver already dead. The car sustained heavy damage upon colliding into the junked vehicles. Suspecting that they were dealing with a homicide and not an accident, the police officers summoned agents of the Homicide Division of San Juan's CIC. Forensic sciences experts found a two-inch test tube on the back seat. The tube, covered by a black rubber stopper, contained blue liquid and what appeared to be a foetus. This gave rise to endless speculation. The victim's brother would subsequently tell researchers that the foetus was in fact a toy, and that he himself owned a similar one."